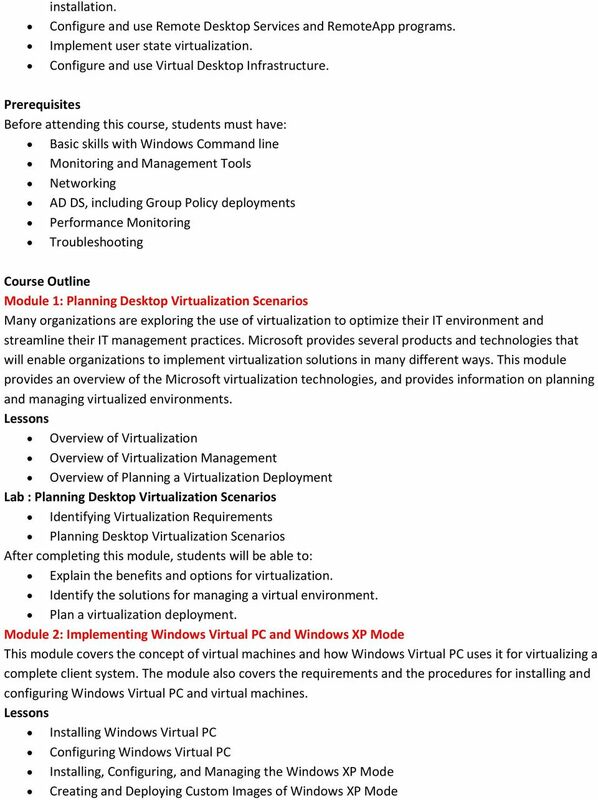 Download "Implementing and Managing Microsoft Desktop Virtualization"
6 Planning and Configuring the Sequencer Environment Performing Application Sequencing Advanced Sequencing Scenarios Lab : Sequencing Applications for Virtualization Sequencing an Application Sequencing a hard-coded application Describe how to implement application sequencing. Plan and configure the sequencer environment. Sequence applications for virtualization. Perform advanced sequencing. 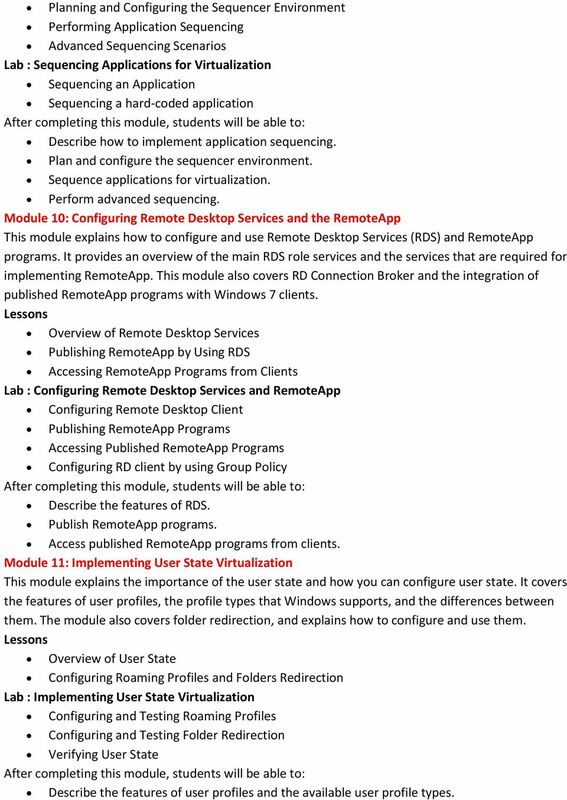 Module 10: Configuring Remote Desktop Services and the RemoteApp This module explains how to configure and use Remote Desktop Services (RDS) and RemoteApp programs. It provides an overview of the main RDS role services and the services that are required for implementing RemoteApp. 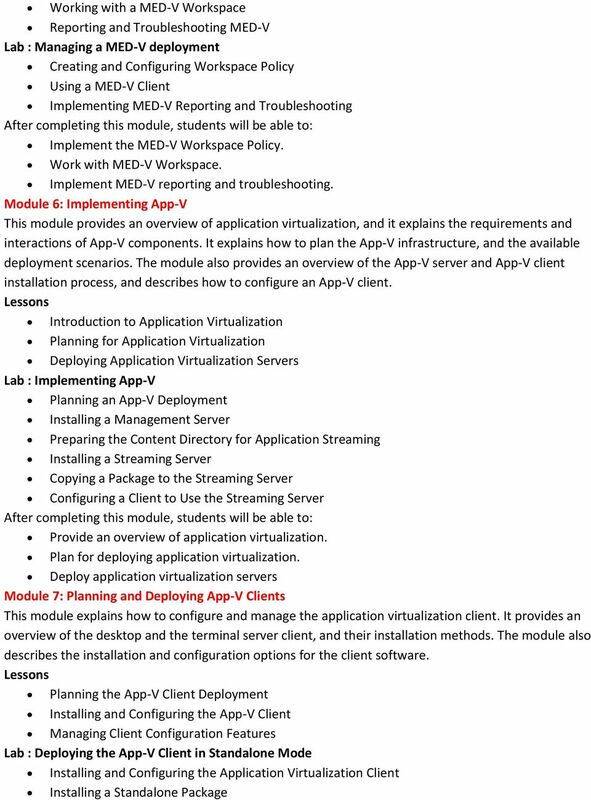 This module also covers RD Connection Broker and the integration of published RemoteApp programs with Windows 7 clients. Overview of Remote Desktop Services Publishing RemoteApp by Using RDS Accessing RemoteApp Programs from Clients Lab : Configuring Remote Desktop Services and RemoteApp Configuring Remote Desktop Client Publishing RemoteApp Programs Accessing Published RemoteApp Programs Configuring RD client by using Group Policy Describe the features of RDS. Publish RemoteApp programs. Access published RemoteApp programs from clients. 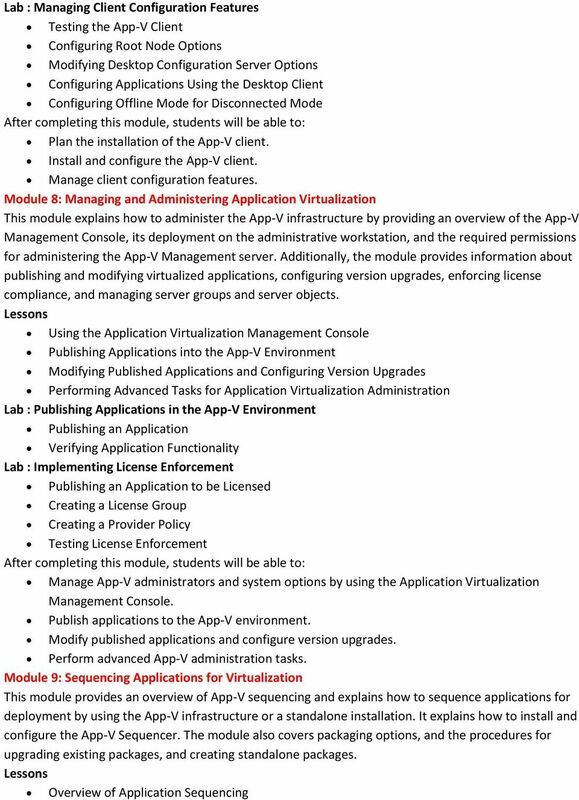 Module 11: Implementing User State Virtualization This module explains the importance of the user state and how you can configure user state. It covers the features of user profiles, the profile types that Windows supports, and the differences between them. The module also covers folder redirection, and explains how to configure and use them. Overview of User State Configuring Roaming Profiles and Folders Redirection Lab : Implementing User State Virtualization Configuring and Testing Roaming Profiles Configuring and Testing Folder Redirection Verifying User State Describe the features of user profiles and the available user profile types. 7 Configure roaming profiles and folder redirection. 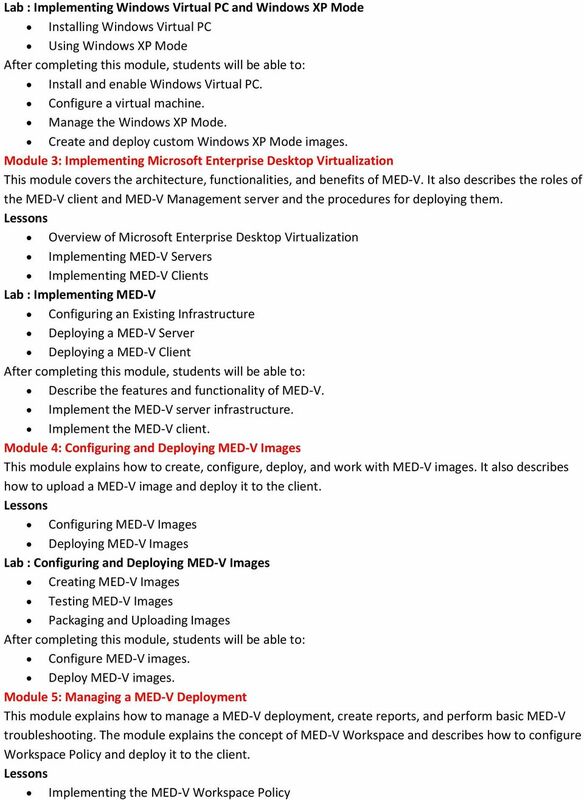 Module 12: Configuring Virtual Desktop Infrastructure This module describes how to configure and use Virtual Desktop Infrastructure (VDI). It provides an overview of Hyper-V server role and the integration of VDI with RDS and Hyper-V. The module also covers the procedures for configuring different types of virtual desktops and explains how to configure a virtual machine for use as a virtual desktop. 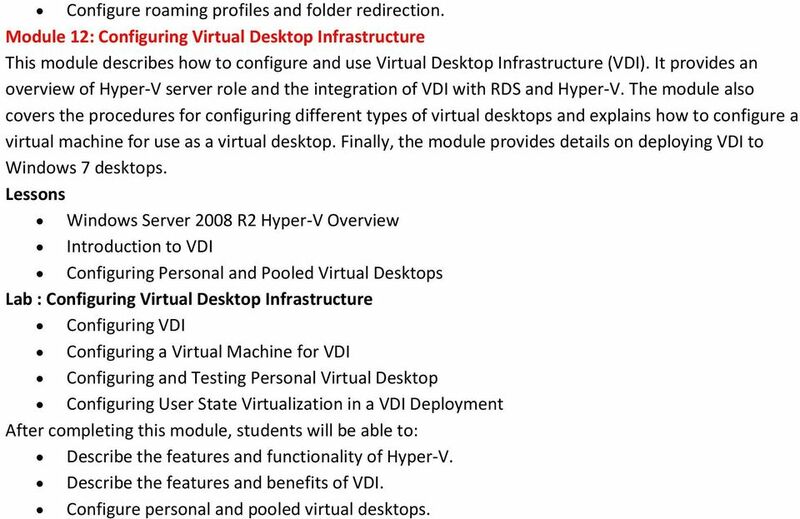 Finally, the module provides details on deploying VDI to Windows 7 desktops. Windows Server 2008 R2 Hyper-V Overview Introduction to VDI Configuring Personal and Pooled Virtual Desktops Lab : Configuring Virtual Desktop Infrastructure Configuring VDI Configuring a Virtual Machine for VDI Configuring and Testing Personal Virtual Desktop Configuring User State Virtualization in a VDI Deployment Describe the features and functionality of Hyper-V. Describe the features and benefits of VDI. Configure personal and pooled virtual desktops. 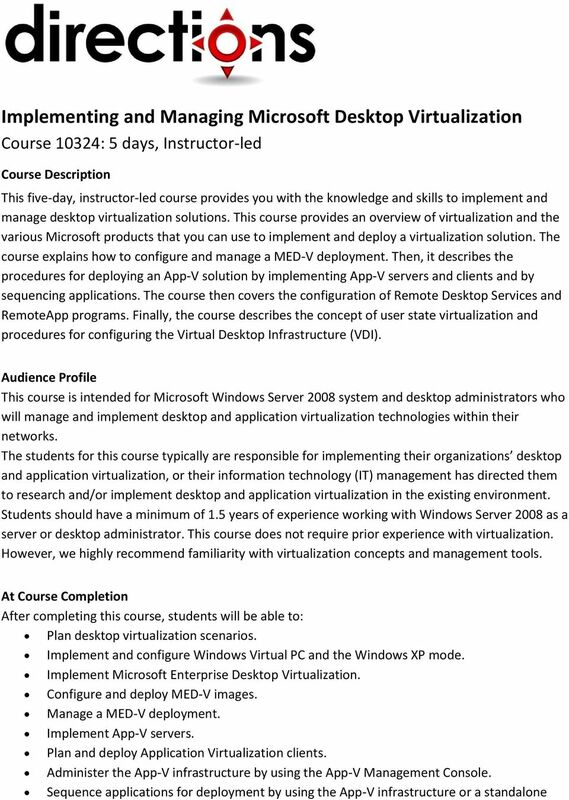 MOC 10324A: Implementing and Managing Microsoft Desktop Virtualization Course Overview This course provides students with the knowledge and skills to implement and manage desktop virtualization solutions. Skills to 2008 About this Course This five-day instructor-led course teaches the features and technologies of 2008 and 2008 R2 to IT professionals who have specialist skills in working with 2003 technologies. Course Syllabus. 6416: Updating your Network Infrastructure and Active Directory Technology Skills to Windows Server 2008. Key Data. MS-50292: Administering and Maintaining Windows 7. Course Objectives. Required Exam(s) Price. Duration. Methods of Delivery. MS-50292: Administering and Maintaining Windows 7 This five-day instructor-led course provides students with the knowledge and skills to successfully install, maintain, and troubleshoot Windows 7 computers.